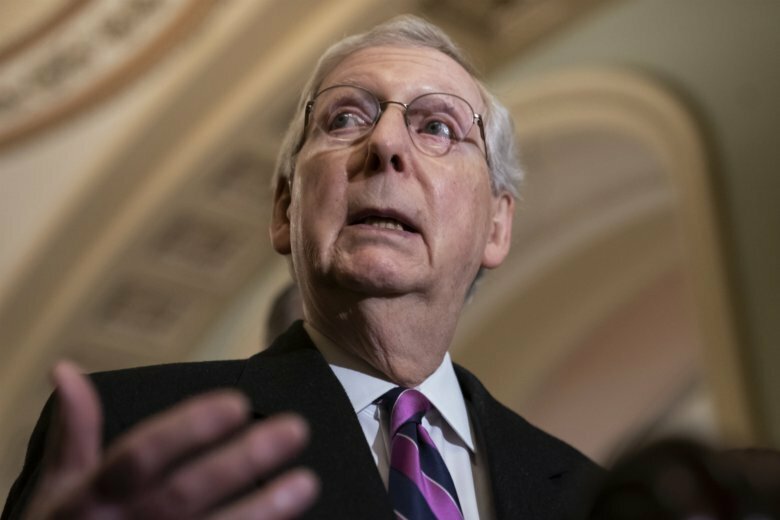 LOUISVILLE, Ky. (AP) — Senate Majority Leader Mitch McConnell acknowledged Monday that opponents of President Donald Trump’s declaration of a national emergency along the U.S.-Mexico border have enough votes in the Republican-led Senate to prevail on a resolution aimed at blocking the move. McConnell, who fell in line behind Trump despite his own misgivings about the declaration, said Trump will veto the resolution and that it’s likely to be sustained in Congress. McConnell’s remarks in his home state came after fellow Kentucky Sen. Rand Paul became the latest GOP lawmaker to say he can’t go along with the White House on the emergency declaration. “I think what is clear in the Senate is there will be enough votes to pass the resolution of disapproval, which will then be vetoed by the president and then, in all likelihood, the veto will be upheld in the House,” McConnell told reporters. Besides Paul, other Republican senators who have announced they’ll defy Trump on the issue are Susan Collins of Maine, Lisa Murkowski of Alaska and Thom Tillis of North Carolina. With those four, and assuming that all 47 Democrats and their independent allies go against Trump, that would give opponents 51 votes — just past the majority needed. Paul told reporters Monday that based on conversations with colleagues, there are “at least 10” GOP senators prepared to vote to nullify Trump’s move. The vote is expected next week. The Democratic-led House recently voted to upend Trump’s declaration, which he declared to circumvent Congress and funnel billions of extra dollars to erecting his proposed border wall. McConnell, who has worked closely with Trump on the tax system overhaul, the selection of conservative judges and other issues, acknowledged he had counseled the president against making the declaration. The Senate leader said he’s worried that Trump’s move would set a precedent for future Democratic presidents to make such a declaration for their own purposes. “That’s one reason I argued, obviously without success to the president, that he not take this route,” McConnell said. Many lawmakers opposed to the emergency declaration say it tramples Congress’ constitutional power to control spending. They also are concerned Trump would siphon money from home-state projects to barrier construction. McConnell didn’t comment Monday on Paul’s position on the declaration. At a GOP dinner this past weekend in Kentucky, Paul said: “I can’t vote to give the president the power to spend money that hasn’t been appropriated by Congress. “We may want more money for border security, but Congress didn’t authorize it. If we take away those checks and balances, it’s a dangerous thing,” Paul added, according to the Bowling Green (Ky.) Daily News. Under the declaration, Trump would divert $3.6 billion from military construction to erect more border barriers. He’s invoking other powers to transfer an additional $3.1 billion to construction. Lawsuits have been filed aimed at derailing the declaration, which could at least prevent Trump from getting the extra money for months or more. Other lawmakers including Sen. Lamar Alexander, R-Tenn., have been trying to persuade Trump to abandon the emergency declaration and draw the money from other budget accounts that he has the power to tap. Paul said he spoke to Trump Sunday night and detected no signs of backing down. “I think he’s made his decision,” he told reporters.